In any part of Costa Rica, you will find gallo pinto (pronounced gah-yo peen-toh) served for breakfast. Basically, it is rice and beans. The beans are usually black, but sometimes they are red. The rice and the beans are first cooked separately. Then, they are added to a frying pan that has sauteed onions, garlic and sometimes red pepper. 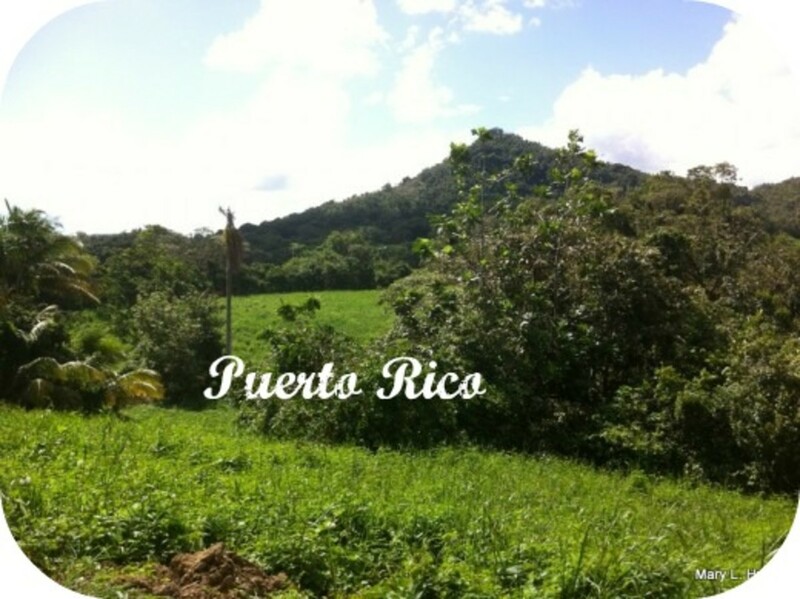 There are different styles of making gallo pinto. 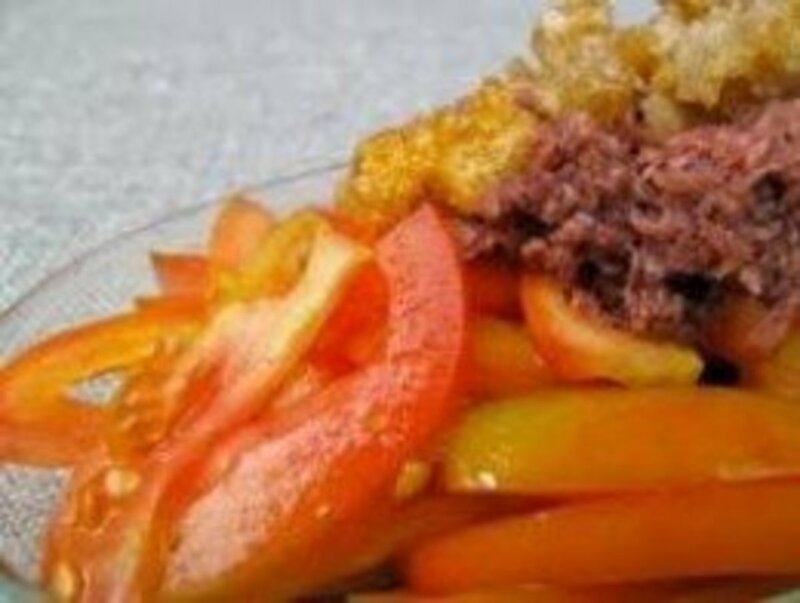 This particular recipe is from the Cartago area, which is characterized by the onions and red sweet pepper as ingredients, which is my favorite. 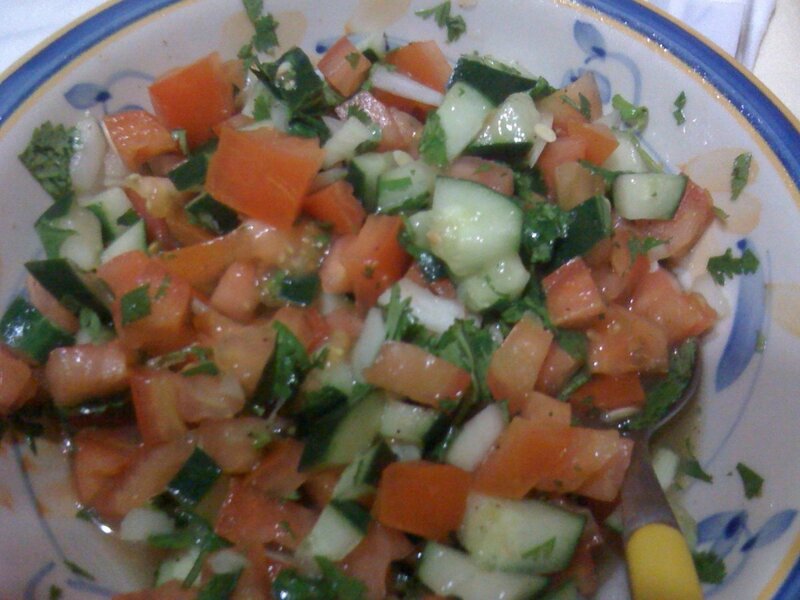 Another aspect of having this dish are the accompaniments, which are covered in the final section. It is also a dish which can also incorporate leftover meats. The accompaniments make a Costa Rican breakfast complete, however some people just have gallo pinto alone with their rich and tasty Costa Rican coffee. Put the oil in a frying pan and heat it up. Cut up and dice the onion and red pepper into small pieces. Sauté the onion and red pepper for 3-4 minutes and then add the crushed garlic cloves. Sauté for another 3 minutes and then add the beans plus the 1/2 cup of the stock from the bean pot. Add the chicken bullion cube and allow it to dissolve as you are stirring the beans and sauteed onion and red pepper. Then add the 2 tablespoons of Salsa Lizano. Cook for a couple of minutes and then add the cooked rice. Mix the rice into the beans thoroughly, cooking until the whole mixture is thoroughly heated. Add salt to taste. The two most common accompaniments are fried ripe plantain (plantano maduro) and natilla (sour cream). 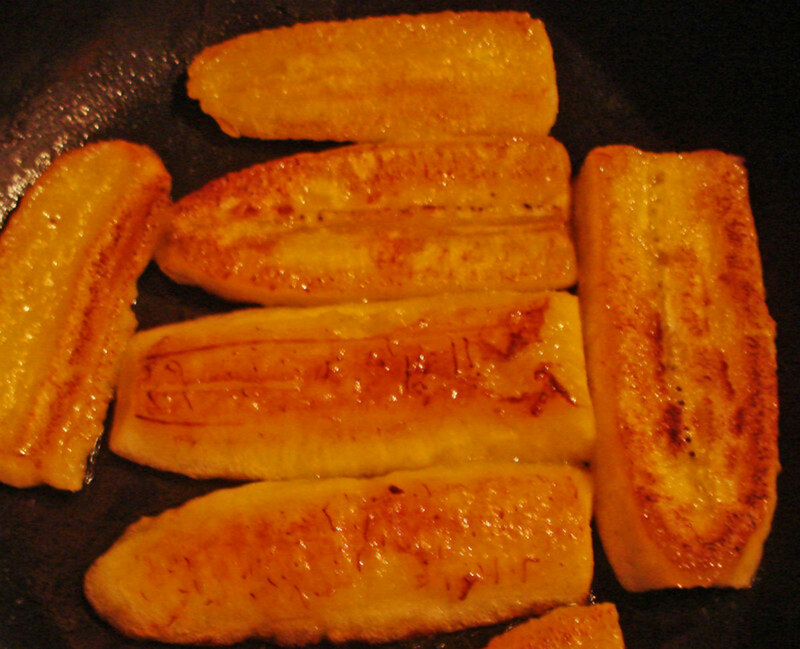 To make the maduro, buy a green plantain in the store and let it ripen like a banana. It will get yellow and soften. Then you slice it lengthwise and fry it in oil for a few minutes - it doesn't take long. You need to watch it closely so it doesn't burn. Natilla is a little different from the sour cream that you get from the United States, it is sweeter and it is thinner. You can make a modification of U.S. sour cream by mixing it with whipping cream or half and half until it thins to a thick pouring consistency. You can sweeten the cream with a little sugar and add a bit of salt to taste. The natilla is put on the side or on the top of the gallo pinto. It is good with the maduro as well. Besides fried or scrambled eggs, fresh white cheese is another common accompaniment for a gallo pinto breakfast. This is an immature cheese that is common in Costa Rica and can also be found in markets that have Mexican food in the U.S. This cheese can be served plain or as fried slices. 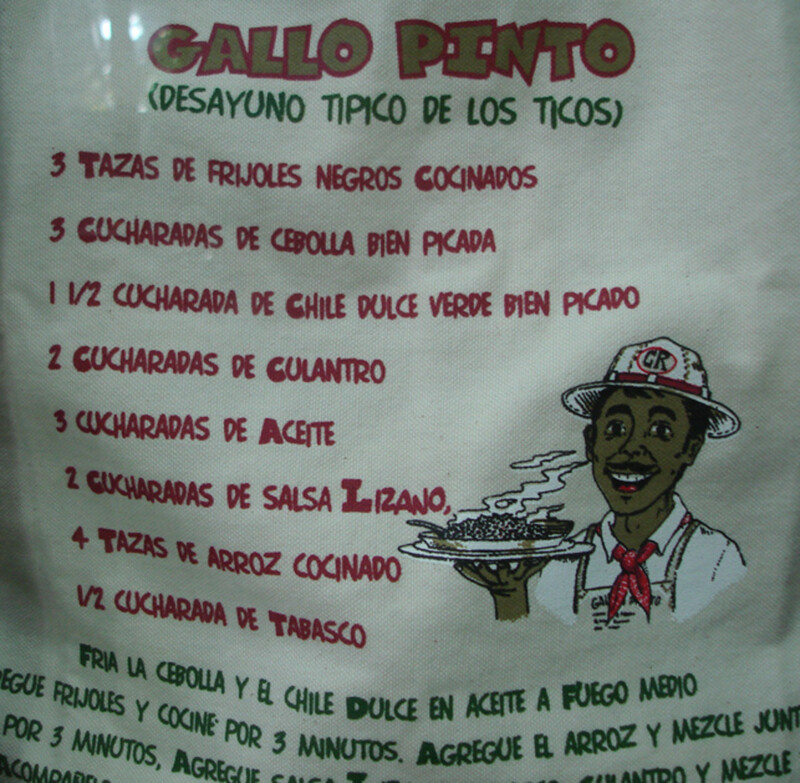 Meats are sometimes served with gallo pinto. 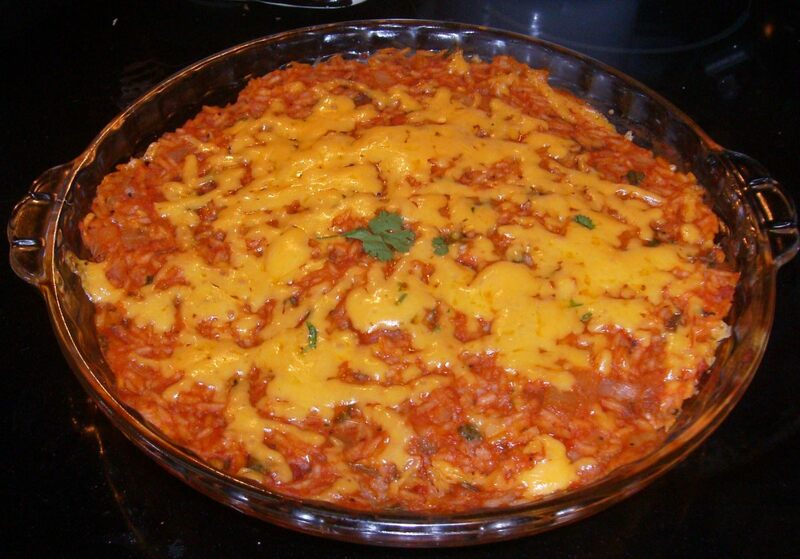 It is not common to have it mixed in with the rice and beans, but many households do this with leftover beef or sausage. I particularly like tongue in tomato sauce (lengua in salsa rojo). The tomato sauce nicely compliments the basic flavor of the gallo pinto. The Salsa Lizano is a key ingredient that adds flavor to the gallo pinto. It is not a common ingredient outside of Central America, but there are online sources where you can purchase it, as indicated below. This green-colored sauce has a vinegary taste and is mildly piquant. There are clones of it from other companies in Costa Rica called "salsa inglesa." For a substitution, I have used Mexican salsa verde (green sauce), adding some cider vinegar and white pepper. Tomatillo sauce with some vinegar is another possibility. Pinto beans and chow chow - it certainly has been a long time since I tried that. Yum, I like my beans. We used to eat fresh black eyed peas and pintos from my grandfather's garden, they are so much better than dried peas and beans, more mellow and exquisite in flavor. Reminds me of the Southern recipe for pinto beans with chow chow. Would love to try it! 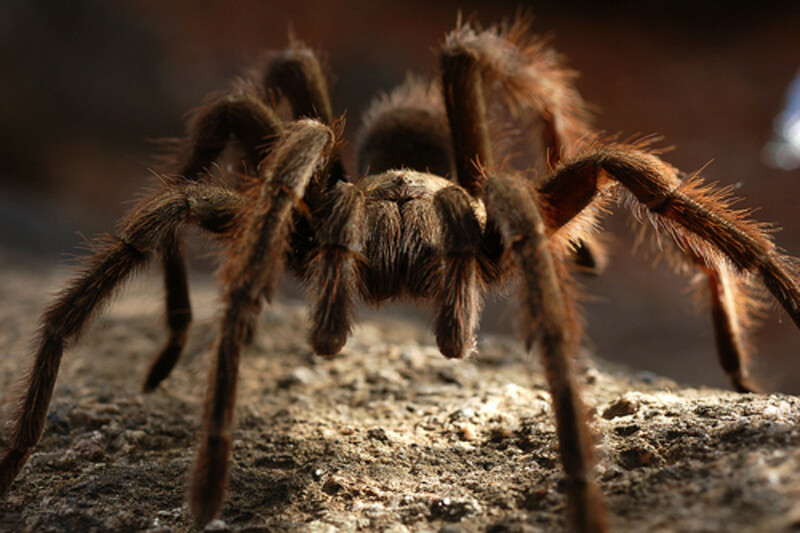 Randy M.: What delicious slices of Costa Rican cuisine! The photograph is hunger-inducing, and the recipe tastes like more. 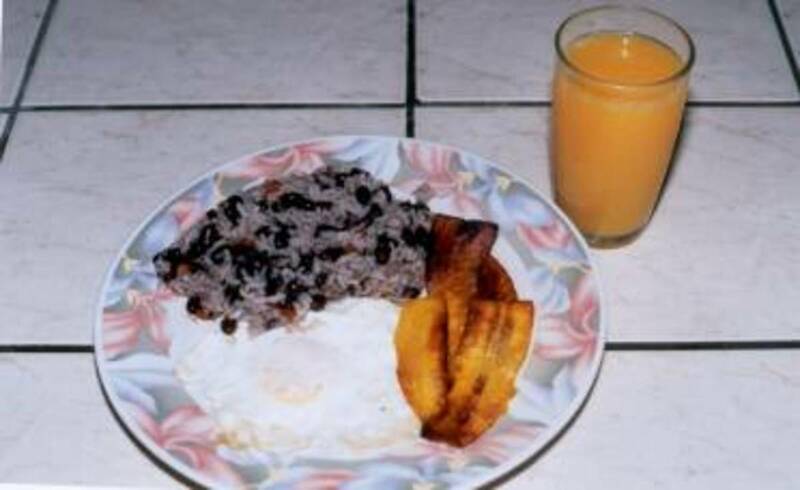 In particular, I like the accompaniment of the black beans and rice with the eggs and white cheese. But it also is great the way in which the dish lends itself to the incorporation of scrumptious leftovers.